Last week was one of my favorite weeks this year, as I got to spend most of my time with my hands on flowers. What a pleasure! I had 3 different occassions with varying colors and styles, but they ended up being all in water – no oasis for me last week. My first occassion was a home delivery I do every other week. My client loves fresh flowers (she has great taste) and we try to work with ones that will last a while. 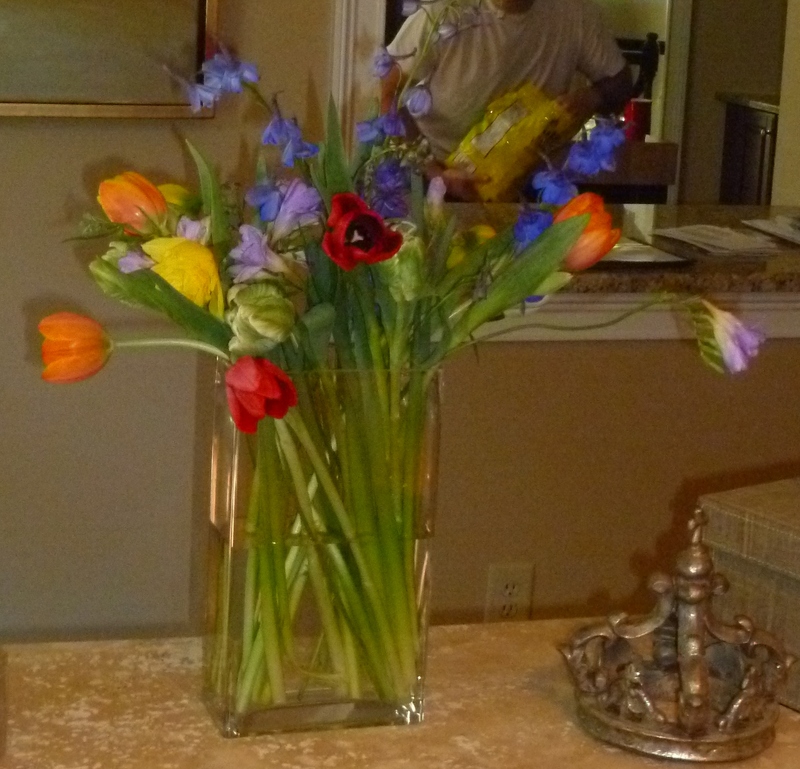 But last week was a splurge: tulips, daffodils, fressia, delphinium and more tulips. Of course we knew that would only last a little while, but they are so pretty while they do! Here’s a tip to keep all fresh flowers longer: keep them away from warm things like direct sunlight and heat from electronics; change the water when it starts to cloud, rinse out the vase and re-cut the stems before you put the flowers in the fresh cold water. As the arrangements sit over time, the water builds up bacteria and becomes warmer – 2 things flowers don’t like. 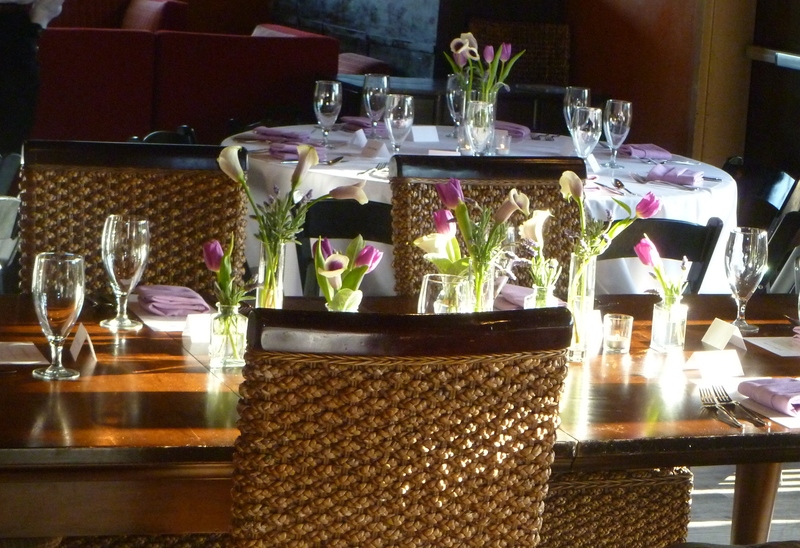 Also, don’t be afraid to re-work the arrangements to eliminate the fading flowers and highlight the more durable blooms. 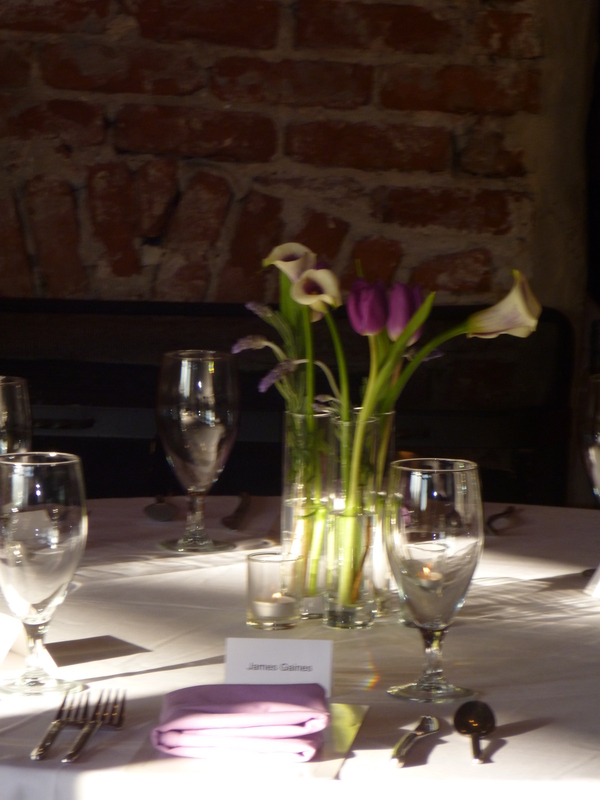 My second event was a rehearsal dinner with a simple theme of purple callas and lavender, though I loved the tulips so much I added some. Also I needed them, as the wholesaler missed the mark on the purple color I ordered and only had a choice of white callas with purple centers or dark schwartzwalders. They rarely make an oops and gracioulsy included the purple tulips to make my design work as close to plan as possible. I went with the white callas with purple centers and they really added a nice touch in the candlelight. The arrangements were in straight 7″ bud vases and a bunch of other fun vases I picked up. Mixed with candles, the look was perfectly elegant! 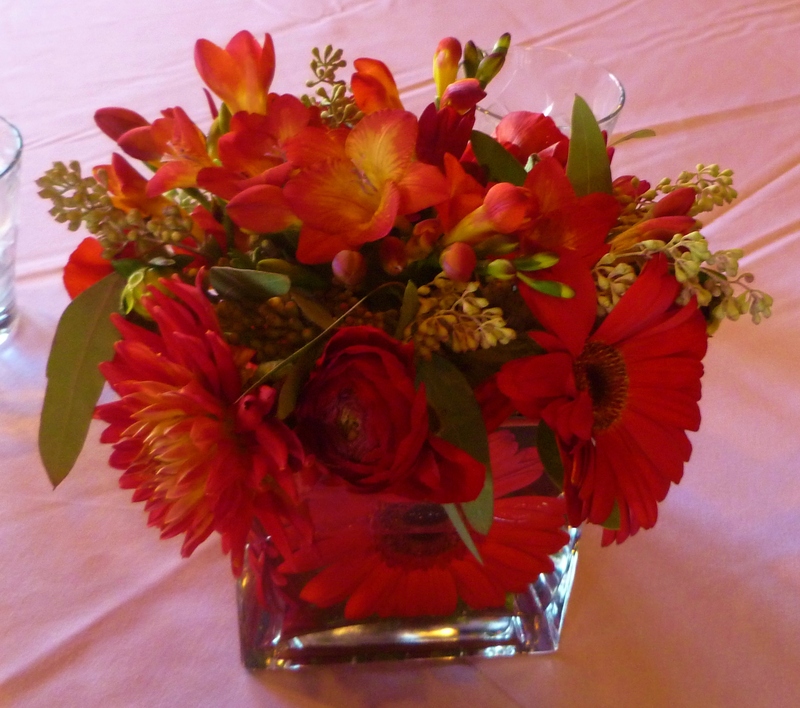 My third and final party was a bridal luncheon with red centerpeices. I chose gerbers, dahlias, ranunculus and freesia with a hint of seeded eucalyptus. I submerged a gerber on each side of my square vases to add color below and a bit of whimsy. This client wanted an urban chic look which came off nicely using monochromatic flowers in glass. What a great week in water! Can’t wait to do it again! 20 Apr	This entry was published on April 20, 2012 at 1:20 pm. It’s filed under Centerpieces, Classic, Clean, Modern, Rehearsal Dinners, Romantic and tagged callas, centerpieces, daffodils, dahlia, flower, freesia, home arrangements, lavender, purple, ranunculous, red, spring, tulips, vases, water, wedding. Bookmark the permalink. Follow any comments here with the RSS feed for this post.